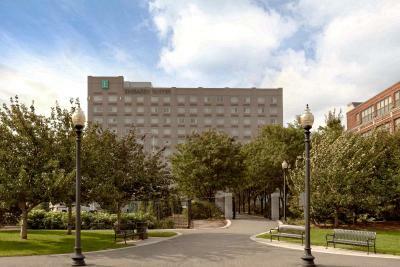 Lock in a great price for Embassy Suites Boston at Logan Airport – rated 8.4 by recent guests! We stayed here the night before a flight out of Logan. Nightly manager reception was free and had tons of stuff, no need to buy dinner for us. Breakfast was also well stocked with everything that anyone could want - cooked to order omelets, crispy bacon, hot oatmeal, pastry, fruit you name it. This makes it well worth the price and make sure you figure this in when you look at the price. Shuttle every 20 minutes to airport was great. The bed and bedding was comfortable. Room layout was pleasing. The front door staff was exceptional. The man, John, came to our car to give directions to the front door and also offered to come in and show us the way. Close to the airport!! Helpful and friendly staff. Great bartenders and awesome breakfast! I love how clean this property is from the lobby to the every detail in the rooms. Most everything was good. Room seemed updated, good location, and the airport shuttle is great. They held our luggage for us on the last day, which was nice of them. Staff was very friendly. Beautiful hotel. Loved the reception in the evening. Set up of the room was great too. Shuttle to the airport was great. Outside of parking, an awesome place to stay. 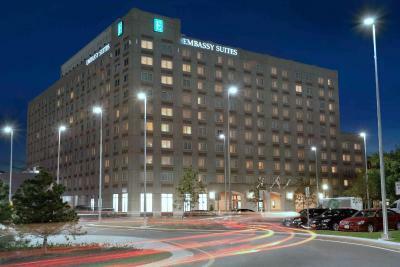 Embassy Suites Boston at Logan Airport This rating is a reflection of how the property compares to the industry standard when it comes to price, facilities and services available. It's based on a self-evaluation by the property. Use this rating to help choose your stay! One of our top picks in Boston.Providing free shuttle service to Logan International Airport and located close to Boston's main attractions, this all-suite hotel offers a complimentary cooked-to-order breakfast and an on-site restaurant, Porter Grill and Bar. The Logan Airport Embassy Suites features two-room suites with 2 HDTVs and a sofa bed. Guests can also take advantage of in-room microwaves and refrigerators as well as the free evening manager's reception, featuring light snack and nonalcoholic beverages. The hotel also features business facilities with a conference area for up to 300 guests. A fitness center, indoor pool and a whirlpool are also available. Exploring Boston is easy when staying at the Embassy Suites Boston at Logan Airport. With free shuttle service to the 'T' (underground) station, guests can easily visit the attractions of the city center. The Boston Convention Center as well as the city's financial district are within an 5 miles radius of the property. East Boston is a great choice for travelers interested in harbors, food and history. 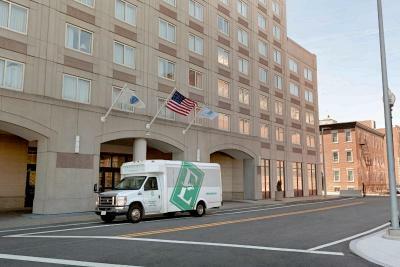 When would you like to stay at Embassy Suites Boston at Logan Airport? Suite features a separate living area with a sofa bed, kitchenette, and large conference table. This suite features a living room with a 55" HDTV, a sofa bed, an armchair, a wet bar and a 39" HDTV in the bedroom. This accessible suite features 2 TVs, a seating area with a sofa and an accessible tub. This suite is furnished with 2 queen beds. This suite features a separate living area, 2 TVs, a refrigerator, a microwave and an activity table. 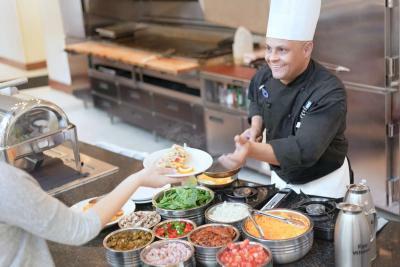 House Rules Embassy Suites Boston at Logan Airport takes special requests – add in the next step! Embassy Suites Boston at Logan Airport accepts these cards and reserves the right to temporarily hold an amount prior to arrival. Management of this hotel group should outlaw the practice of putting the tipping bowl out for cooked breakfast. It's a normal service in many other countries at 3 star level and the expectation of the cooking staff that they are entitled to a tip for something fairly standard is laughable. In fact the receptionists were brilliant, yet performed their job without the "tipping bowl" expectation or attitude. I like the responsiveness and attention to detail of the reception and housekeeping staff . The gym equipment is in good condition. The rooms are clean and regularly serviced. Make sure to ask for a room with a window to the outside if you prefer fresh air. 1) Clerk who answered my call from the airport gave me entirely incorrect information about where the hotel shuttle would pick us up. We only got the shuttle because I saw it drive in and waved to get attention of the driver. It was cold out and we were freezing looking for the shuttle. 2) it took 20 minutes last night of running the hot water tap before we got any hot water. Something is seriously wrong with your plumbing. Breakfast. Fairly good omelet, but I have had better at other hotels.